All transactions are safe and secure with a reliable history in online purchasing behind each of our associates. 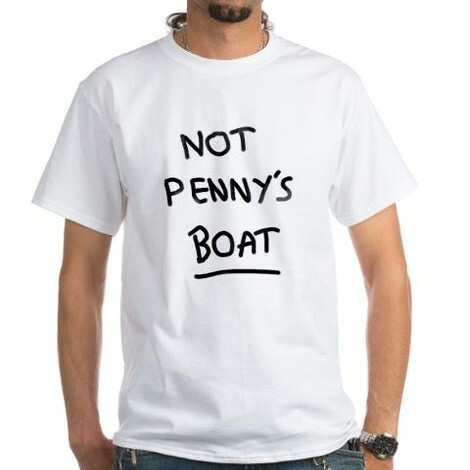 Buy the Not Penny's Boat Lost t-shirt to own Lost clothing and merchandise. "Not Penny's Boat." Before Charlie dies, he writes this message on his hand and shows it to Desmond, who in turn conveys it to the rest of the group. Charlie's message sparks the biggest dilema yet to be seen on the Lost TV show. Should the survivors follow Jack or Locke? The former still believes that the boat is their best chance at being rescued, while the latter believes that the arrival of the boat is a threat to their safety. Wear this Lost t-shirt to remind everyone of Charlie's message. In addition to the Not Penny's Boat Lost tee above, browse the Lost Clothing Gallery for more apparel like men's and women's clothes, kids shirts or hoodies.